Recently I discovered the possibility that one of my ancestors was living in an Almshouse. So naturally, as any family historian would do, I set out on a journey to discover whether this was true or not. 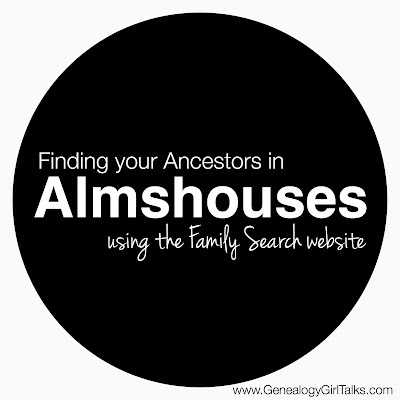 The first step in my journey was to educate myself on what an Almshouse was, where to find information and records, and learn the other names for these homes. I discovered that an Almshouse was also referred to as a Poorhouse, a Poor Farm, and even a County Farm. These names can be confusing when researching your ancestor. My advice would be for you to use each of these terms in your searches. In the United States many Almshouses were located at the county level - you may find the information you seek by contacting the local County courthouse. Keep in mind that these facilities were often used prior to mental hospitals and nursing homes so their records may be elusive due to privacy issues. An important term I discovered during my journey is that although we refer to the individuals in these facilities today as "residents" they were labeled "inmates" during the early 1900's. This little bit of information helped me in my search, however, I am saddened by the lack of compassion in the description. Please realize there is a lot of information regarding the history of Almshouses that I haven't uncovered, however, I have successfully conducted searches online using the US Census Records for the State my ancestor lived. I want to share with you the process I used and hope to assist you on your journey to finding your ancestors. To search for your ancestor it is important to know the name of the facility and the county in which it was located. To find this information, you can view the "Paupers in Almshouses 1910" book on Google Books. This is a free-to-view book that will give you the State, County, and name of the facility. You will also be able to view the number of residents ("inmates") who lived in the facility. The link for the book is here. Once you arrive at the link, use the "Search this book" feature by typing in the State and/or County you are researching. The list of States appears around page 49 when I conducted my most recent search. After you have the name and county of the facility, add it to your records. You will need it later to search online using your favorite search engine. Hopefully you will discover the history and records for the Almshouse you are researching. Now that you have the name and county of the facility, head over to the Family Search website to conduct your research. After you arrive at the Family Search website, click on the "Search" image near the middle of the page. Do not enter any of your Ancestor's information (although you will be tempted to enter this information). Scroll down to "Browse all Published Collections" - this is the search you want to perform. Click this link. You will be taken to a page with all the searchable collections provided by Family Search. In the search box to the left enter the following text "United States Census" and you will see the US Census listed by year. Select the year you would like to search and click on it. Now, once again, you will be tempted to enter your Ancestor's information (I know I was). Instead you will enter two pieces of information. The first is the "Residence Place" - here you enter the county. The second piece of information to enter is the "Relationship to Head of Household" - this is a dropdown box located down the page. Enter the County and State of the records you want to search. Then, from the dropdown box, select "inmate" - many residents of Almshouses, Poorhouses, and Poor Farms were referred to as "inmates" in census records. Click the "Search" button. You will now arrive at your search results based on the information you entered. There are a few key points to remember when viewing your search results. Your search results will display both inmates at prisons and "inmates" at Almshouses. The "Head of Household" could be a family who lived there as well. Be sure to search the surrounding counties. In my experience I have found that the Almshouse "inmates" are both male and female with varying ages. If you click on the name of one of the search results it will take you to the page displaying all the individuals at this facility. You can usually tell if it is a prison and/or Almshouse. When you click on an individual's name, take note of the information at the bottom of the page (source citation information) - this information can be used to search US Census records at ancestry.com or at your favorite website to search the US Census records. I hope you find the information you seek on your Ancestor. If you found this article helpful and/or if you found your Ancestor in an Almshouse, let me know in the comments below. I would love to hear from you!